This is one of my vintage cookbooks and I recently thought I’d look a few things up. It’s from 1965 and the first thing I wanted to see is what the President’s wife contributed to the book. I was pleasantly surprised to find that it was a recipe for one of my favorite things to eat, Popovers! Now I don’t know why, but hardly anyone ever makes them anymore. If you’ve ever read Little Women, you’d know that the girls take their precious breakfast popovers to the poor family and Amy is upset by the loss! Also, when I was a youngster, my father used to take us to a lovely restaurant, called The Proud Popover. This restaurant was a colonial in theme, with big pewter mugs and plates and gigantic popovers. I was addicted to those things. I’d drench them in butter and honey. Wonderful. Our family wanted to make them at home, but as my mother had passed away, and we kids were not the best cooks yet, my dad found a mix that he’d buy and they were as close as possible to heaven for a couple of 70’s era kids. Well, now I make these from scratch, because really, what could be easier and Mrs. Lyndon B. Johnson’s recipe is practically the same as anyone you might find online. (I don’t like that tradition of the ladies going by their husband’s names as if her only identity is through the husband, but that’s for another blogger to write about.). I don’t use melted shortening, however, I use canola oil , but everything else is the same! Also, she tells us you can use a regular muffin tin, but to get that true popover height, you need a good iron popover pan. I found mine at…you guessed it! Resale! You have to eat them right out of the oven. The crispy outside and the almost empty middles, make a perfect vehicle for adding veggies or casseroles if desired, but I prefer them as I did when a child, with butter and honey. Here. Have one. This post is a bit about your humble writer. Since I’m trying to have this blog sound like we’re just two people chatting over the fence, you should get to know me a bit better! I’m an old-fashioned gal. I like to bake from scratch, listen to old-time radio, (my favorite is Jack Benny! ), I always have an open door, hot food and a sympathetic ear for anyone who needs a friend. I’ll admit, when younger, I always admired the Mother of the Bride’s dress rather than the actual bride and now that my girls are entering a marriageable age, I pin matronly, yet glittering dresses that I will lovingly shop for someday! In general, I think I was born an old woman! I’ve never been afraid to get older. Of course, no one likes the aches and pains that come with age, but somehow, I just always connect better to older ideas. Maybe because I was raised by my auntie after my mother died, maybe because I was never a pretty young woman, but for whatever reason, in my head, I always see myself as the mothers from the old movies, like Andy Hardy and Public Enemy. I do wear an apron in my kitchen, vintage ones I pick up when I can find them. I am a bit plump. However, I have hair the color of ripe plums and I swear like a sailor, so I guess there, the resemblance stops! Today, it is a cloudy, humid day. Blueberries were 1 dollar a pint so I picked some up for a nice, comforting cobbler. With the Those Were The Days show playing on the radio, I’m perfectly at ease. I hope you will come over. The coffee pot is always on and the timer just went off, so the cobbler is hot. Do you collect something? Most people do. Seashells, beanie babies, shoes, maybe? I collect old cookbooks and cooking pamphlets. I have hundreds of these little booklets and it is just so fun to page through them. It’s even educational! Like a little walk through history. Here are a few of my books. You can pick these up very inexpensively at used book sales, antique stores or garage sales. Most of them will not set you back more than a few dollars. I just love the Settlement cookbooks subtitle, “Way to a Man’s heart.” This cookbook is not the original from 1901, but rather a much-loved 1928 edition. To tell the truth, I prefer the loved copies best. It’s delightful to read another housewives notes and clippings. My copy has a handwritten recipe for Tuna Surprise (yeah, no thanks), and a handful of articles from the local newspaper, including one entitled, “Old-Fashioned Roast Cookery is Unpatriotic” from a 1942 Chicago newspaper! These little articles are valuable to me! As you can see, sometimes the backs are more interesting than the front! Wouldn’t you love to “Dine and Dance” at Chateau D’Jean? 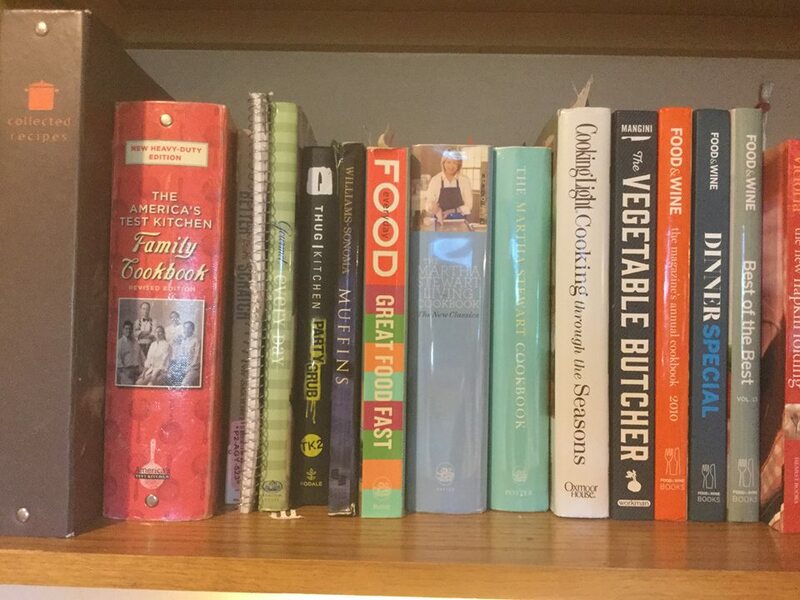 My oldest book is the White House Cookbook, which I inherited from my Aunt. It was her Mother-in-law’s book and started me on my quest for more like it! The book is EXTREMELY fragile and rarely removed from its safe haven. It’s been well-used in its many years of existence. I actually had an American Family cookbook from the same year, but it was even more fragile, so I donated it to the local historical society here in town. So my idea, what with all these lovely books, is to make a few recipes from some of them and show you how they turned out! I’m looking them over and in the next few days should have some interesting ideas.